- Speak out source and target text. - Translate words, phrases and sentences between 50+ languages. - Select SMS and translate. - Send translation by SMS or bluetooth. 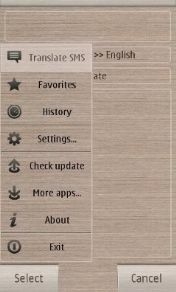 MobiVioSolutions gTranslator v1.0.1023 S60v3 S60v5 SymbianOS9.x Signed URL http://symbian2share.blogspot.com/2011/09/mobiviosolutions-gtranslator-v101023.html. NEXT.